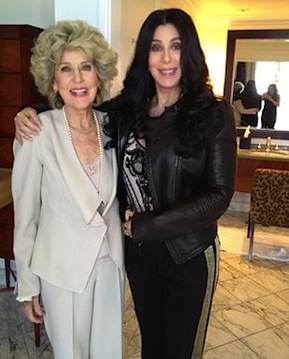 Cher posted a photo of her and her 86 year-old mother, Georgia Holt on Twitter right before meeting president Obama at a LBGT fundraiser at the Beverly Wilshire. Let me just say, what a hot grandma. I can only hope to look 30% as good as her in 60 years. Did Jane Fonda and Betty White open a spa at an undisclosed location where they sacrifice babies and eat peasants in a bathtub full of milk like Charlize in Snow White? I demand answers, and so does Obama. Apparently the president playfully asked about her Holt’s diet after Cher told him that she’s 86. I cant believe that so many american people cant see through yobama! He is as anti american as hitler! He wants to ruin merica and start over with a dictatorship!!! And Cher. Shes more American than mosg of us.. Why would she want to socialize with him???? ?Hes ruinin her heritage worst than mine!! !